Oil on panel. 29,5 x 23 cm. The young man looks at an indeterminable point beyond the viewer. He appears distant from any worldly issues rather than as a present individual. The blue sky and the white stripe of cloud are indicative of a progressive artist. The young man appears ascetic, dressed in simple clothes with a stola over his left shoulder, as was customary for Venetian men over 25. There are no details, background landscape or architecture to highlight the man’s status or wealth. The intense and highly precious ultramarine background colour was produced in pulverised form from lapis lazuli and adds an element of exclusivity to the small portrait. Bellini was one of his time’s leading painters in Venice and is today known as one of the greatest artists of the Renaissance. 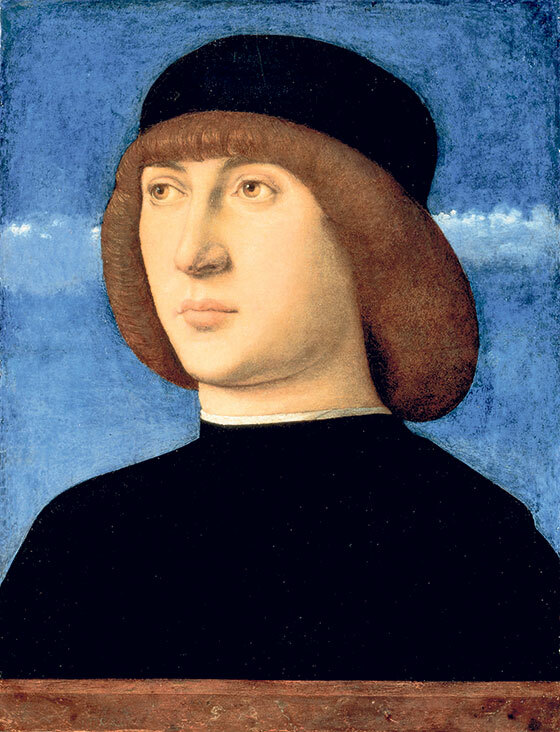 He was the son of the famous painter Jacopo Bellini and brother of Gentile Bellini, who was also a renowned painter. Around 1500, Bellini’s workshop was the largest in the city with a comprehensive production of altarpieces and andachtsbilder. Bellini was groundbreaking as a portraitist and for his execution of religious subjects, particularly altarpieces. With his colourful, harmonious and innovative compositions, he became decisively influential for an entire generation of artists.